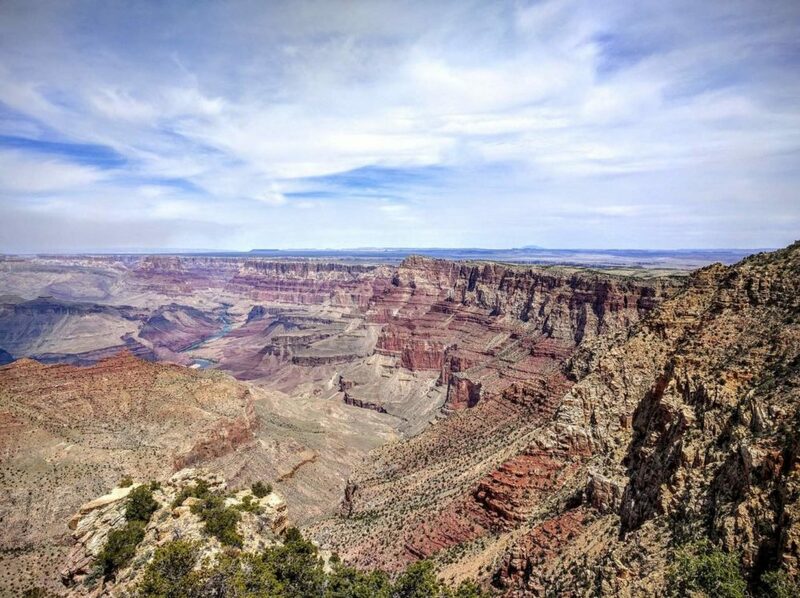 Visiting Grand Canyon National Park on the South Rim required a lot more planning than I had originally expected, but this is why I planned our stay for two weeks. I wanted to see the Grand Canyon at a leisurely pace, as well as visit other nearby national monuments and parks. Today, I pass my wisdom gained on to you, dear reader. For me, there were two factors that determined when I wanted to visit Grand Canyon: weather and tourist crowds. Grand Canyon is open all seasons and receives nearly 5 million visitors per year. Last year in 2015, that number rose to 5.52 million visitors. Summer (June-August) is peak season for this national park, not only is the weather hot but the crowds fierce and the parking scarce. In Spring (March-May), day temperatures are relatively mild at 50 to 70 degrees F depending on your altitude, and rainfall is relatively low. The Grand Canyon is the land of extremes so the night time can cool down to as low as the mid-20s. Locals tell me that March and April are Spring Break months for many schools, so expect a lot of kids and college students. Autumn (September-November) weather is about the same as Spring but the temperature can drop unexpectedly so bring lots of warm clothes. Since students are back in school, the on-site hotel and on the trails will be light with tourists. 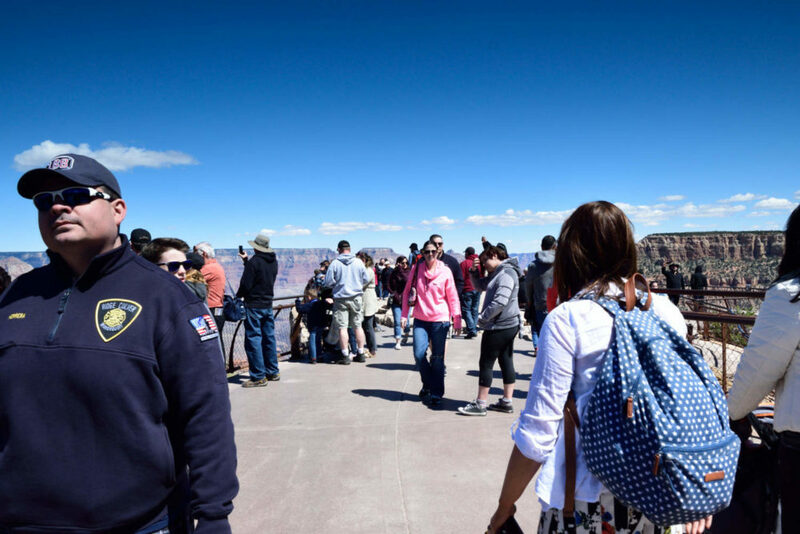 Spring Break Crowds At Mather Point where students and their cell phones gather. My main factors in selecting a place to stay were price and location. Since we tow around our 30-foot Airstream, we are obviously going to stay in either an RV Park or Campground. I went with Railway RV Park because I had 50% off for the first 7 days of our stay than 10% off for our next 7-day stay. This brought down the cost to roughly $36/day. It would have been nice to stay within the park at Grand Canyon Trailer Village but it would have cost $50/day, and not including the expensive costs for food at the in-park market. Just a block away from Grand Canyon Railway RV Park is a nice and reasonably priced Safeway. Although Railway RV Park is an hour away from the National Park, its also 30 to 40 minutes away from other parks and national monuments. I went for price over the scenery. I was overhearing many people say that the train ride was kind of boring. The drive certainly is dull landscape, but it’s also cheap, so we drove in our truck from Williams, AZ. Inside the park, parking spaces near the main Visitor Center fill up quickly; the later you visit in the day, the more likely you’ll have to go to overflow parking. The park’s South Rim Shuttle Bus system can pretty much take you anywhere along the south rim; as far as Hermit’s Rest on the west and Yaki’s Point to the East. If you want to visit Desert View Tower and Tayusan Museum, you’ll have to drive there. 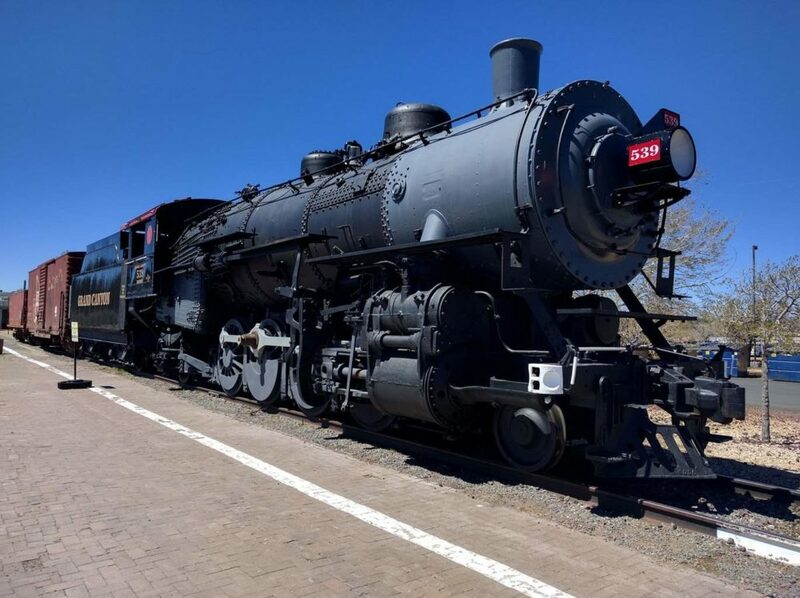 To take the steam train, its roughly $67 round trip. This is beyond our budget, so we opted for the parochial route. By the way, you’ll want to download the Grand Canyon Pocket Guide and Shuttle Map beforehand. The food prices inside the park are of the captive tourist variety. We’re talking $10 deli sandwiches and $5 hot dogs at the low end, and then $25 entrees at the posh rim-side restaurants. Even the groceries are marked up by a couple of dollars. I decided to pack our lunch in to get the best bang for my buck. Besides, nothing beats sitting on a quite rock looking down at the Colorado River and the multi-hued walls of the Grand Canyon. Thankfully the park has spring water stations all along the trail. But if I had to buy lunch at the canyon, I’d go for Bright Angel cafe, they had reasonably priced and very tasty baked goods and drinks. You cannot go wrong with the Grand Canyon when it comes to views, but my main concerns were tourist crowds and a stunning pano shot. 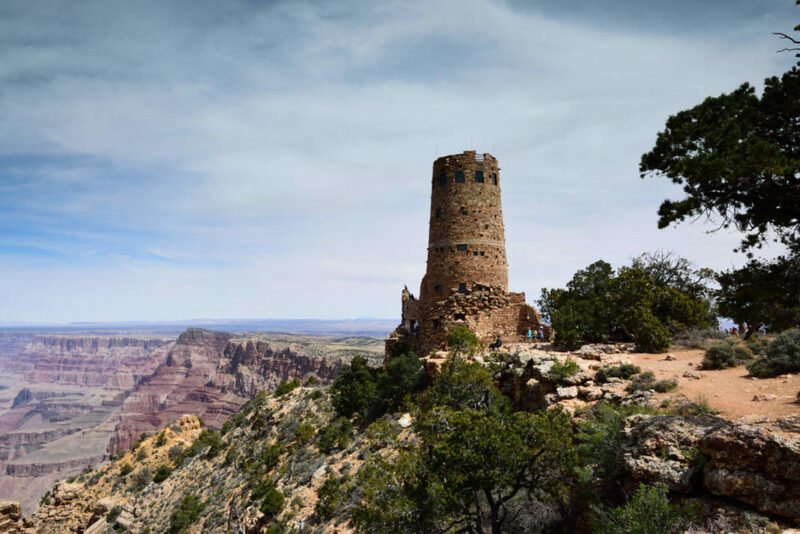 Architect Mary Elizabeth Jane Colter designed six landmark buildings near the South Rim between 1905 and 1935, and Desert View Watchtower is by far the most stunning. During shoulder seasons and before 10 am, it’s also the least crowded of the drivable stops. I encourage you to stop to take in the panorama because it is one of the best in the canyon. There is a stretch of the Colorado River clearly visible 5,000 feet below. To the east Cedar Mountain towers from the plains against the sky. Inside the tower is a re-creation of Ancestral Puebloan art and architecture found on Mesa Verde and Hovenweep. Then take a quick hike along the rim and away from the crowds. Take a moment to absorb the view and feel it within your soul. Close to the main South Rim visitor area, Yavapai point possibly provides one of the best panoramas of the inner canyon, the Colorado River, and Bright Angel Canyon. Here you can also see Phantom Ranch, Bright Angel, and North Kaibab Trails. It is also one of the best places for both sunrise and sunset photography. Although it can get crowded, go early or stay late to watch the sunlight hit the canyon walls and watch the colors shift as the Earth rotates. While the spirit of adventure is a fine companion to wing it with, the Grand Canyon is also an international destination and your spirit will flag if you get stuck circling the parking lot like a starving turkey vulture with a chorus of “I want to see the canyon!” coming from the back seat. Plan ahead and have a backup in case things don’t work out. That way you can enjoy one of the world’s greatest natural wonders with a sense of peace and serenity.